I am thrilled when I stumble across a table setting that is warm and inviting, yet a bit of surprise. 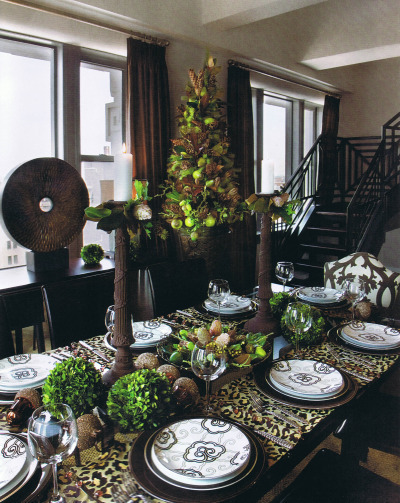 I want to share this sophisticated, earth tone tabletop design by Diane Breckenridge and floral designer Scott Hepper, presented in this spectacular urban St Louis setting. 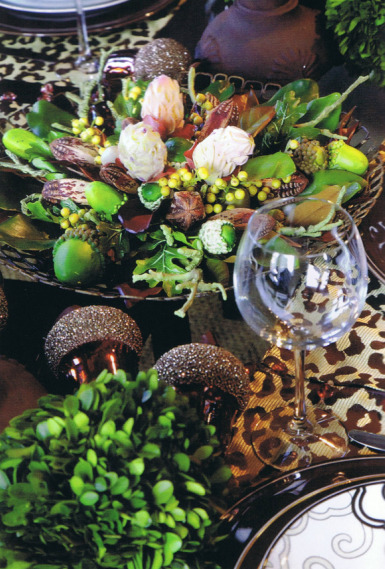 I just love the eclectic mixed flavor of the tablescape, the subtle colors, the sheer elegance of the china and the stemware, the textured herringbone silverware, the natural presence of boxwood spheres, the classic tower candlesticks, the festive glass acorns and -of course-the exotic animal print linens. I am especially tickled with the bead-work detail on the Leopard print placemat. The center flower arrangement with magnolia leaves and pods, is definitely a conversation masterpiece-hats off to Scott Hepper! Photos: Courtesy of “St.Louis Homes and Lifestyles” by Rob Grimm.